Halloween is over, which means that means that the holidays — the real holidays, the ones you get days off for — have officially arrived in LA. Whether that fills your heart with joy or dread (or both), you’ll still need to figure out what to do with yourself over the coming months. Fortunately, we’ve eliminated the guesswork and put together a holiday itinerary that’ll give you the social safety net you’ve been hoping for. 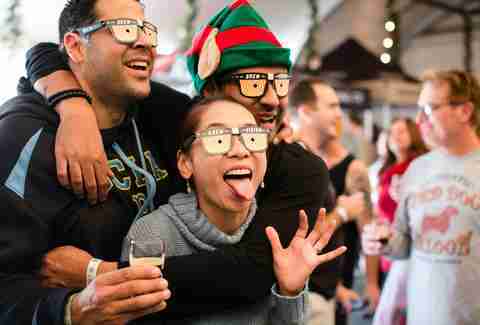 From Turkey Trots and booze fests to spirited caroling and the infamous SantaCon, here are LA’s essential winter-themed events to warm your Grinch-like heart. 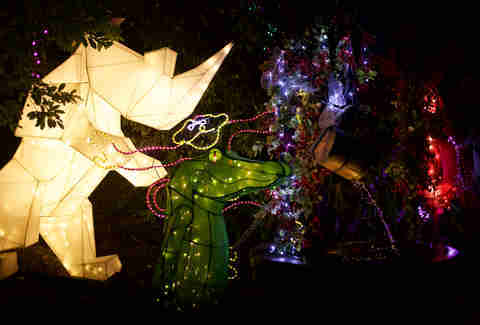 A lantern art festival for the ages, Moonlight Forest transforms the Arboretum into a full-fledged winter spectacle. With fun art, food trucks (like Son of a Bun and Sabores de Mexico), and booze, it definitely has the potential for a date night grand slam. The annual Christmas Fantasy Parade is always a monster of Disney-sized proportions, but since it’s only an hour away it’s kind of a no-brainer. Pro tip: The best time to go on Space Mountain is during the parade, so if your idea of festivity somehow doesn’t include holiday Mickey, you’re still in luck. Cost: Admission differs based on the day, but can range from $97 to $135, or even up to $185 for a Park Hopper on peak days. 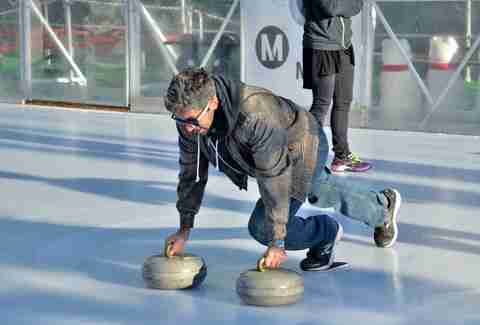 DJ-led and free skate sessions, gay skate nights, and curling lessons set the scene at this outdoor ice rink smack in the middle of DTLA. Reindeer, which are real and not just fictitious Santa Claus animals, will be hanging out at Reindeer Village at the LA Zoo for you to visit. Not a reindeer fan? That’s weird because they are rad as hell, but the rest of the zoo will also be decked out in wintery splendor during Zoo Lights, which includes NYE festivities, a happy hour lounge, and more. 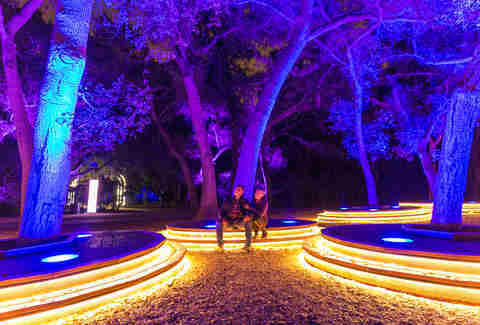 The beloved garden is once again bringing back the Enchanted: Forest of Light for a mile-long walk through an always-impressive set of light displays (some of which are interactive). There will be two lounges set up along the way too, so make sure to get your food and drink on. Need to get some exercise AND be give back to the community before you stuff your face with a thousand pounds of Thanksgiving fixins? Behold, the Turkey Trot: a charity race through DTLA benefiting The Midnight Mission. The Queen Mary will be decked out with twinkling lights, live music, food & drink, family activities, and a whole lot more this year for the iconic ship’s annual holiday party. 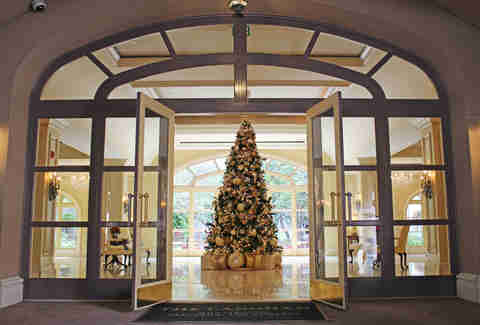 Head to the Langham on November 25 for their final Heritage with Heart event of the year. A ticket gets you access to their tree-lighting ceremony, photobooth fun, Santa, a performance by the Lythgoe Family Panto, and holiday food and refreshments. Remember Westbound? One of the Arts District’s best cocktail bars closed earlier this year, but has reopened as Here & Now under the helm of Va’La Hospitality and Westbound’s original founder Sarah Meade. They’ll be doing a fun winter popup this year, complete with a snow machine, themed entertainment (think Bad Santa), and of course, winter-themed food and drinks like spiked hot cocoa. You know the drill for booze festivals in LA, and this one’s no different; grab a ticket for access to unlimited wine tastings (with some beer) as well as some small bites. Actually, it’s a little different: 50% of each ticket. Let’s be real: SantaCon is a huge nightmare. The streets are filled with stumbling Santas at every corner, most of them far too merry, and you’ll probably. But is there a part of you who wants to be one of those stumbling Santas? Yes. Yes there is. Any beer fest that takes place at the Phoenix Club is a beer fest that you want to be a part of — especially one with more than 100 craft brews on offer. So much of LA’s best beer is brewed in Anaheim (like Noble Ale Works, Bottle Logic, and so many more), making this is an absolute must-do for any beerhead. 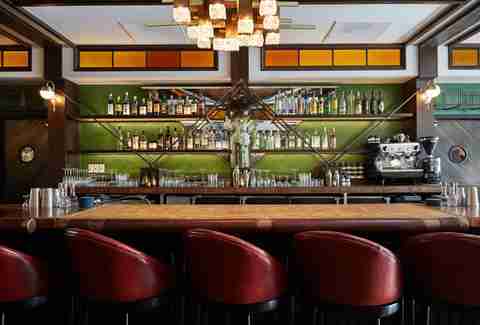 If you’re looking to crawl your way through the holidays (and you’re not alone there), a good place to start is the Santa Monica Pub Crawl. You’ll have four crawlable routes, so choose wisely — though if you want our advice, hit the Pier route since the bars are bigger and you’ll have an easier time getting a drink. Also, please don’t forget to eat. Please. Are you the one in your friend group who just can’t get enough Christmas Carols? Big news: Anybody who pretends to hate ‘em also secretly loves ‘em, and probably also wants to get tickets to the Festival of Carols, where over 100 classically trained carolers will be hitting you with the classics. Does toasting to the end of 2018 on a rooftop with a five-hour open bar, food samples, a goodie bag valued at over $100, and top-notch DJs sound good to you? Of course it does; you have a brain in that head of yours. Would you believe that this event somehow only costs 60 American dollars? Well, it does. Congratulations: you’ve won the season. 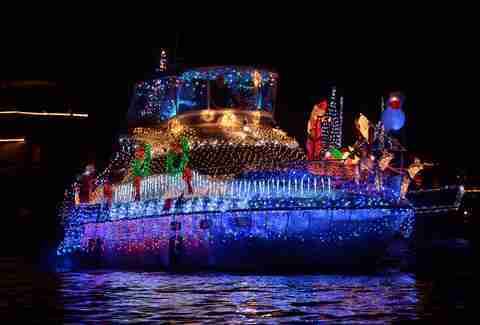 It’s the 110th annual Newport Beach Boat Parade, which means that over a million viewers will be posting up to check out the boats, yachts, and canoes (many of them sporting over $500,000 in Christmas decorations). Oh, rich people. Bless their hearts. Bands, choirs, and dance companies will be spreading the cheer during this free, three-hour Christmas Eve show. It’s A+ family time, to counteract the booze-soaked debauchery you’ve filled the rest of your season with. There’s always so much to do in LA for New Years, so if you haven’t made plans yet, don’t fret. Grand Park’s NYE celebration is always ton of fun, and remains the most family-friendly since it’s completely dry. For a less dry option, consider one of the all-inclusive parties from The Doheny Room, Skybar at the Mondrian, or Poppy. Maybe you want to dress up like you’re from the 20s? Give Prohibition NYE a look. Had so much fun at the Santa Monica Pub Crawl that you’re itching to do it again? Just do it again.